EDMUNDSTON, NB – Les Brasseurs du Petit-Sault has announced the upcoming release of a new limited edition beer to honour a local icon that will soon be leaving the community. 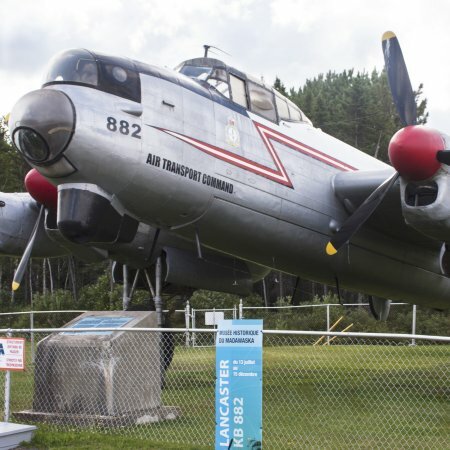 For more than 50 years, a decommissioned WW2-era Lancaster Bomber – serial number KB882 – has been stationed at Edmundston Airport. But due to lack of local funding for upkeep of the classic plane, it will soon be dismantled and sent to the Alberta Aviation Museum. To pay tribute to KB882 before it leaves for good, Petit-Sault will be releasing Lancaster KB882 Märzen on March 30th. The amber lager will be available for samples and growler fills at the Petit-Sault Brewtique in downtown Edmundston, and will also be featured at select ANBL growler stations in coming weeks.